This week’s Tombstone Tuesday photo looks a little different. Different because the subjects of this week’s post have no tombstone. I have been writing about the Kessler family that settled near Chattanooga, Ohio, in the mid-1800s and the trail has led me to this Kessler couple who has no tombstone. But sources indicate that they are buried here. 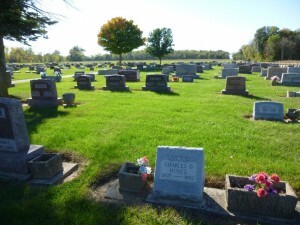 The empty space on the photo is the final resting place of Edward Rudolph Kessler and his wife Almeda (Heffner) Kessler, located in section I, row 15, in the west side of Swamp College Cemetery. 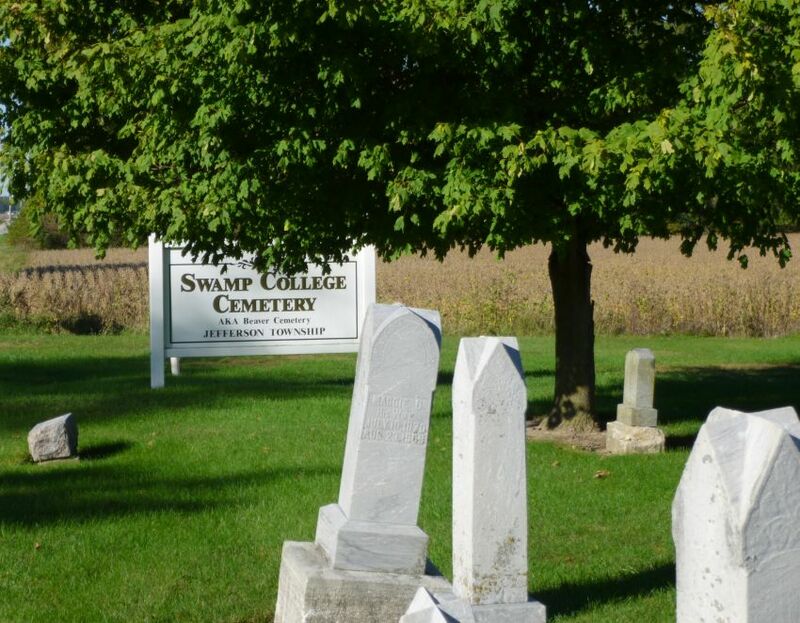 Swamp College Cemetery is located on Karch Road, south of Route 29, Jefferson Township, Mercer County, Ohio. Edward Kessler’s death certificate indicates that he is buried in Swamp College Cemetery. The Mercer County, Ohio Cemetery Inscriptions, Volume VI, 1995, also indicates that he and his wife are buried at Swamp College. However, there is no grave marker for either Edward or Almeda. There is only an empty grassy area where their markers would be. Edward and Almeda Kessler were the parents of an infant daughter who was the subject of last Tuesday’s post. Their child passed away in 1905 and is buried in Kessler Cemetery. According to the records at Zion Lutheran Chatt, Edward Rudolph Kessler was born 11 February 1877 to Christian and Margarethe (Heffner) Kessler. Edward was confirmed at Zion in 1893. Edward Rudolph married Almeda Heffner about 1903. According to Zion Chatt’s records, Almeda Heffner was born 15 May 1883 to Johann and Maria (Tester) Heffner [sometimes spelled Haeffner]. I have been unable to locate a marriage record for Edward and Almeda. Perhaps they married in Indiana. Edward and Almeda lived on Lisle Street in Celina, Ohio, a good portion of their married life. Edward worked for Mersman Brothers manufacturing, where he made furniture. Celina, June 6—Edward R. Kessler, 73, Celina, died at Otis hospital Monday evening. He was a native of Mercer-co. Mr. Kessler was born Feb. 18, 1877. Survivors include his widow, Alameda, and two sons, Clem W., Flint, Mich., and Carl E., Dayton. 1910 US Census, Dublin Township, Mercer, Ohio, ED 110, p. 4B, dwelling 82, line 65, Edward R. Kesler; digital image by subscription, Ancestry.com (http://www.ancestry.com : accessed 5 October 2013); from FHL microfilm 1375227, from National Archives microfilm T624, roll 1214. “World War I Draft Registration Cards, 1917-1918,” digital images, Ancestry.com (http://www.ancestry.com : accessed 13 October 2013), Edward Rudolph Kessler, serial no. 1771, order no. 594, Celina, Mercer County, Ohio; citing World War I Selective Service System Draft Registration Cards, 1917-1918, NARA microfilm publication M1509, roll 1832519. 1920 US Census, Celina, Mercer, Ohio, ED 139, p. 11B, house 504, dwelling 242, line 61, Edward Kessler; digital image by subscription, Ancestry.com (http://www.ancestry.com : accessed 13 October 2013); from National Archives microfilm T625, roll 1418. 1930 US Census, Celina, Mercer, ED 18, p. 14A, house 504, dwelling 338, line 28, Edward R Kessler; digital image by subscription, Ancestry.com (http://www.ancestry.com : accessed 13 October 2013); from National Archives microfilm T626, roll 1850. “Ohio, Deaths, 1908-1953,” index and images, FamilySearch (https://familysearc.org/pal:/MM9.1.1/X619-TJG : accessed 5 October 2013), Edward R. Kessler, 1950. The Lima News, Lima, Ohio, 6 June 1950, p.2. “Ohio Deaths 1908-1932, 1938-2007,” Ancestry.com and Ohio Department of Health, subscription database (http://www.ancestry.com : accessed 18 October 2013); certificate no. 056450, volume 24531. Perhaps a tombstone says more about the living than the dead. Did they not have the money? Did they not have the emotional ties that would lead to wanting a memorial? Did time simply slip away as the family had to cope with continuing their own struggles and events? By the way, the beautiful and striking stone recently placed on the Herb Miller plot in Chatt certainly says a great deal about his life and family and what memories he left with them.